War Pugs! : Bones 3 Figure | H.A.W.K.S. Well, my Bones 4 Kickstarter order was shipped this past week, but it isn’t supposed to arrive until tomorrow; so in the meantime I painted the 3 War Pugs that originally came with the Bones 3 Dwarf King’s Companions Optional Add-on Set. I picked this trio up in an exchange. I prepped the figures in the usual way; soaking them in a dish of water with a couple drops of dish-soap added and then rinsing and drying. I then glued them to 7/8" black-primed fender washers with Aleene’s Tacky glue. I then glued the figures to a tongue depressor with a couple drops of the Elmer’s glue each. 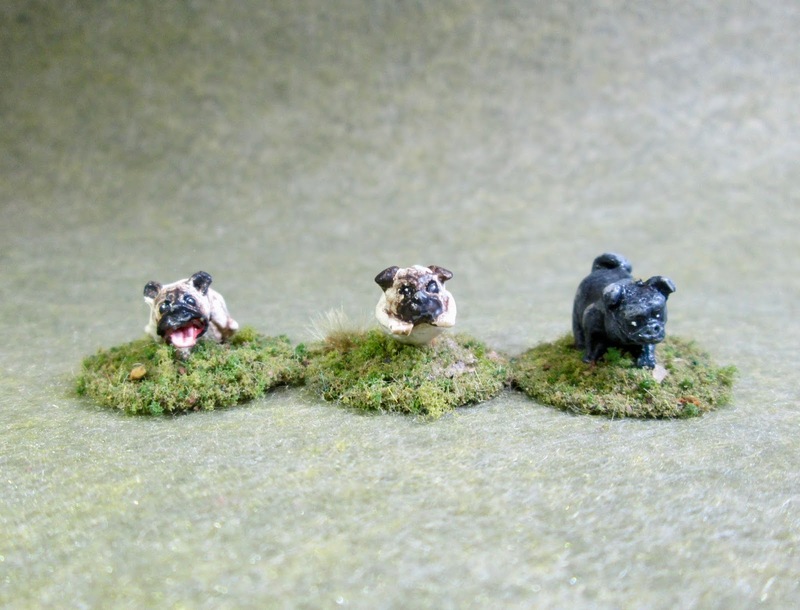 I began by painting two of the pugs with Americana “Bleached Sand”, and the third with Ceramcoat “Black”. 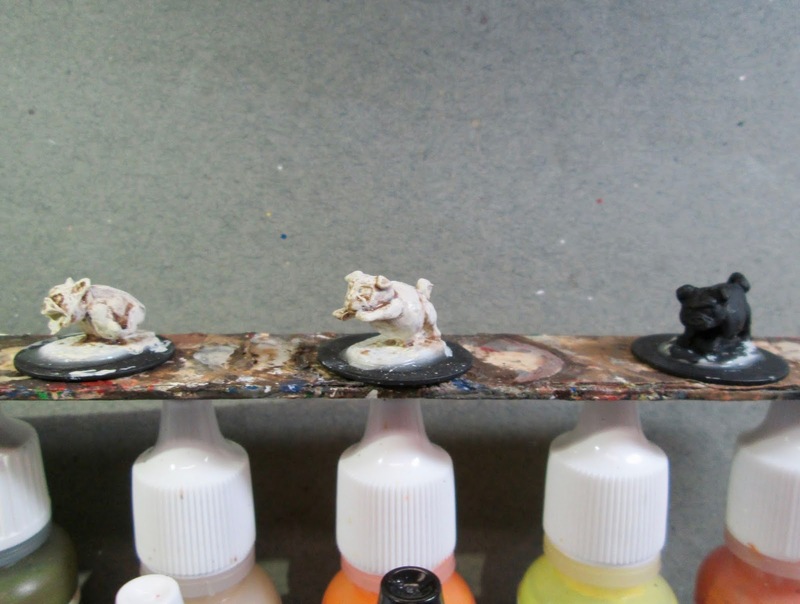 When dry, I gave the two light colored pugs a wash with Citadel “Agrax Earthshade” wash. 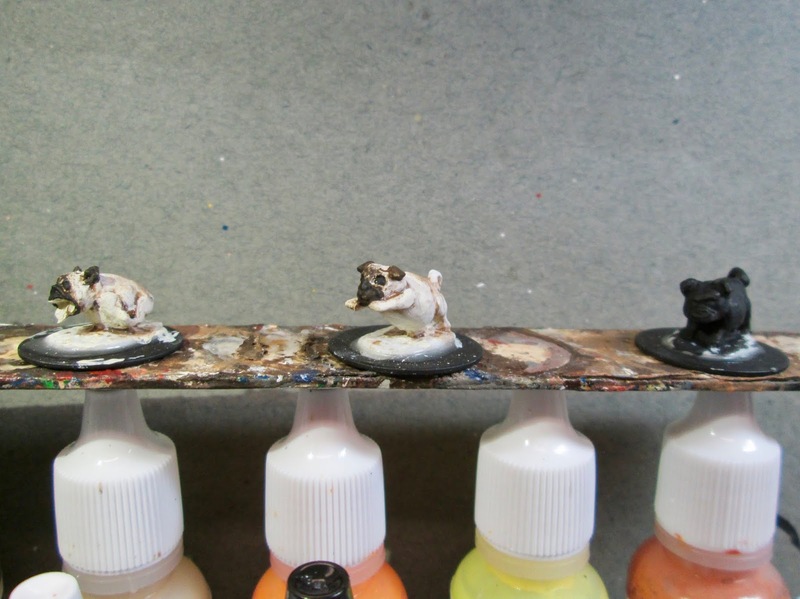 When the wash was dry, I drybrushed the light colored pugs with the “Bleached Sand”, and then added highlights with Ceramcoat “White” mixed with a little of the “Bleached Sand”. 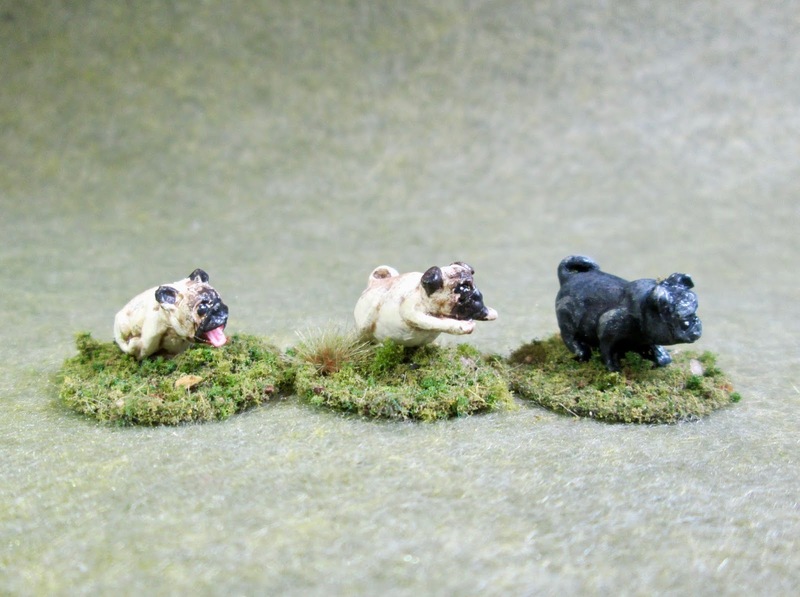 I painted the third pug Ceramcoat “Black”. Next, I did a light drybrush on their lower backs of the lighter colored two with a mix of Americana “Cinnamon”, and Americana “Asphaltum." I then painted their muzzles, ears, and eye sockets a mix of the "Black” and “Asphaltum”. I then painted the inside of the open mouth with a mix of Americana “Shading Flesh” and Crafter’s Acrylic “Tutti Frutti”. While it dried, I painted the eyes and noses “Black”. I then gave the open a mouth a wash with some of the “Agrax Earthshade”. While the wash dried, I added “White” highlight dots to the eyes, and Americana “Neutral Grey” highlights to the noses and around the mouths. After that, I highlighted the tongue with Crafter’s Acrylic “Cherry Blossom Pink”. It was now time to turn my attention to the black pug. I drybrushed him with a little Americana “Zinc” and then added more specific highlights with Crafter’s Acrylic “Storm Cloud Grey”. Lastly, I painted the figures bases with Americana “Mississippi Mud”. I let the figures dry overnight and the next day I gave them a coat of Americana “DuraClear Matte” varnish. 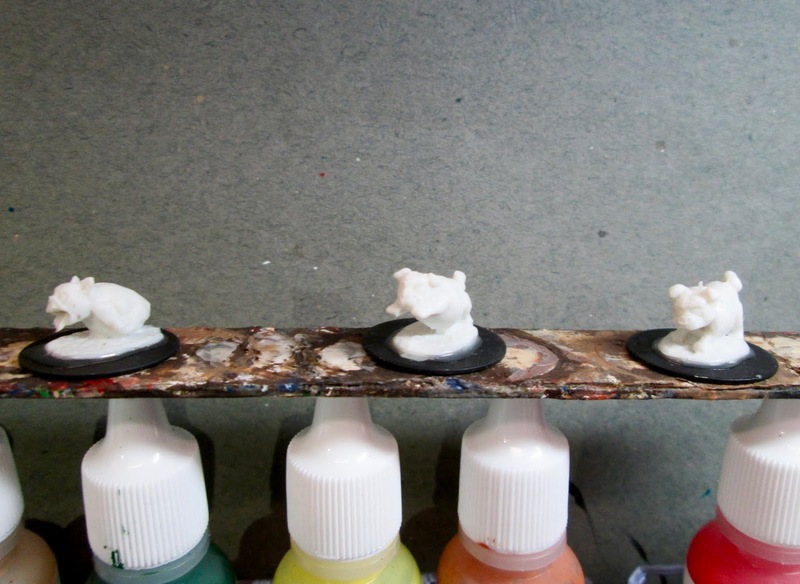 Then, when the varnish was dry, I used some white glue to flock the bases. Another overnight dry, and I sprayed them all with Testor’s Dullcote". So tomorrow I hope to be swimming in Bones 4 goodness! I will try to get some unboxing photos up on the blog either this Thursday, or next Monday, time permitting. Let me know if there’s anything particular you would like pictures of; and if I ordered it, I will try to grab some shots. War pugs? Brilliant, love ’em! Will be watching out for them in future, probably in a Frostgrave game report!